More than ever before, marketers are expected to be smarter in their campaign strategies and faster in their executions. They’re expected to know how to mine, analyse and decode their customer data to derive actionable insights that deliver memorable and high-impact customer experiences. The problem? According to a recent Gartner marketing analytics study, many marketers are spending too much time (up to 20-30 hours per week) trying to manage and corral their customer data, leaving them with less than ideal time and resources to put their findings and insights from that data to work. Another study by the IBM Institute of Business Value found that CMOs are turning to AI to combat this potential loss of productivity, while at the same time delivering greater personalised client experiences and making more informed decisions. In fact, nearly 40% of CMOs are planning to reinvent customer experiences with AI, the study found. AI is already impacting several industries in very tangible ways. Deon cited music producer, Alex Da Kid, who leveraged AI to compile a database of powerful sentiments about love that became a Grammy award-winning hit song, and shared how food company, Knorr used the technology as the backbone of their “Love At First Taste” campaign, which used a survey of more than 12,000 individuals to find that 78% were more likely to be attracted to people who liked the same flavours as them. The campaign garnered massive publicity and response, and was credited with repositioning the brand and driving emotional engagement with Millenials. Several businesses in Asia have already begun their digital transformation journey. During the morning’s panel session, Anindya Dasgupta, global chief marketing and sales officer at Fonterra, recounted how the team’s efforts to transform digitally required a whole new perspective on manpower. Other pointers shared by the panel included the need to ‘self-disrupt’ in order to evolve and adapt to today’s pace of change, collaborating across departments to expose real insights, and looking at AI as a collaborative force that could aggregate a lot of ideas in a short amount of time, and help marketers take some of the guesswork out of the equation. The tools are becoming available for marketers to hone in on the customer experience with newfound precision. From visual-recognition software that can find you the perfect image for your campaign in seconds, to platforms that help you have the right products in the right place with hyper-local data, to infusing machine learning into marketing innovation to better predict what new products will sell, AI is redefining the marketing function. 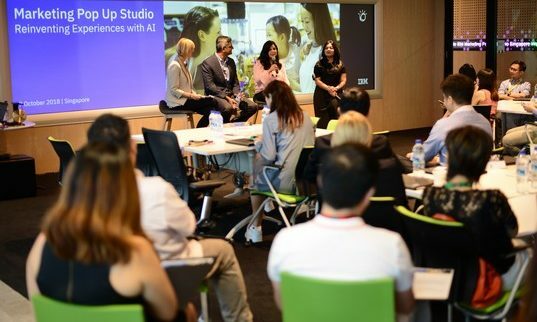 AI might be the new science, but the speakers at the IBM Marketing Pop Up Studio: Reinventing Experiences with AI Workshop, all agreed that the Art still had its place. “Enterprises who are adopting AI with a design-led approach are the ones succeeding. And it’s the CMOs who are instilling a customer-centric mindset across the enterprise through cross-functional collaboration to drive purposeful application of AI and machine learning to deliver personalized customer experiences and business model innovation,” said Charu Mahajan, partner and sector lead – Consumer Goods, Retail, and Travel & Transport, IBM Services ASEAN.